I had my blood work done today. Some of it explains how I've been feeling lately. Some of it doesn't. For instance, it doesn't explain the increasing pain in my right leg that makes it difficult to walk, even with a cane. (The trip from and back to the hospital parking lot was a very difficult walk indeed.) But the doctor thinks it does explain why my feet are cold. (Pretty strange, eh?) The blood work shows that I'm still quite anemic and require another transfusion. This makes for the third transfusion lately, two of them one month after the other. I'm also back on track for round two of chemo. It starts Thursday this week, for four days, followed by the dexamethasone 4 days on, four off, four on, four off the rest of the month. Here we go again! At least this time I know what to expect (I think). Not sure I'm looking forward to it, though. Boxing and boxers makes for a good analogy, here. I really want to fight this thing. 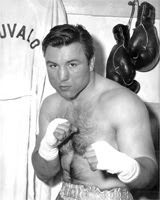 Good choice of art with Chuvalo. In all his fights, he was never knocked out.